Available in four focal lengths: 2.2/10mm, 2.3/16mm, 2.2/25mm and 2.3/35mm, these lenses can be used in a wide range of applications, such as traffic control, 2D/3D measurement, surveillance and security systems, and machine vision. 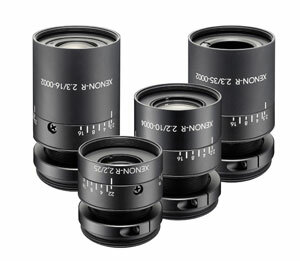 Xenon-Ruby lenses are designed for 1/1.8" sensors (9mm image circle). The robust mechanical design with lockable iris and focus is resistant to vibrations and guarantees an extremely high and uniform image quality over the entire sensor. With a magnification range from ß´ = 0.1 to infinity, the lenses can resolve a pixel size of 4.65µ. The broadband transmission covers the range from 400 to 1000 nm.